Lietošana Piemērots ikdienas lietošanai. Vienmērīgi uzklājiet uz ādas un ļaut pilnībā iesūkties. Nomazgājiet rokas, pēc saskarsmes ar paštonējošo līdzekli. Efekts pilnvērītgi parādīsies pēc 4-6 stundām. 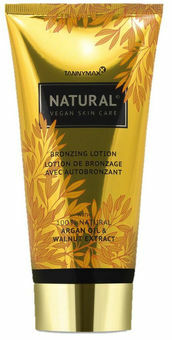 The vegan Natural Bronzing Lotion is a fake tan. This fake tan combines a naturally beautiful tan with an all-around naturally cultivated skin. Thanks to the combination of rich care products and intensive self-tanning agents, the tanning lotion lets the skin brown quickly without having to take a sunbath. The fake tan creates a naturally tanned complexion. The sun tan lotion completely resigns any animal ingredients, parabens and paraffins. 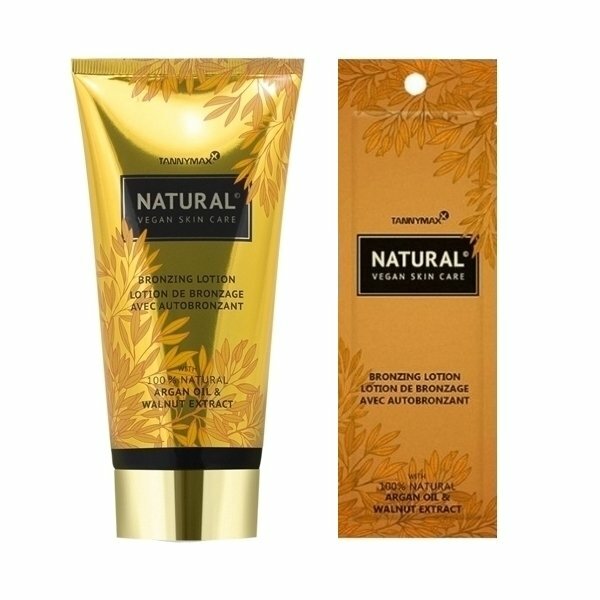 The exclusive combination of natural Argan Oil and Walnut Extract creates a perfect skin care basis for this fake tan. Thus, the fake tan enables an evenly soft tan result. Due to moisture embedded in the fake tan, the skin is constantly protected from drying out. Natural antioxidants included in the fake tan repel free radicals and visibly increase the elasticity and tension of the skin. Thus, sugar-based self-tanning ingredients react with the uppermost layer of the skin and ensure a quick tan without the need of the sun (fake tan) that lasts up to one week. Natural Walnut Extract supports the reaction of the fake tan and further intensifies the tan. The fake tan is suitable for daily use and should be applied evenly to the skin and allowed to absorb completely. After having used the fake tan wash hands. After about 4-6 hours, the full effect of the fake tan becomes visible on the skin. The sun tan lotion provides a tan without a sunbath, but does not contain sunscreen and does not protect against sun burn and skin damage caused by UV rays.